Froo www.froo.com Froo Cross Sell, Free Cross Sell, Cross promote, Marketing, listing Apps, Apps, Application SHIPS NEXT BUSINESS DAY! NEW BLACK RHINESTONE BELT WITH VOLCANO CRYSTAL STONE GLASS PRISM CUT STONE CONCHOS AND WITH WINGED PRISM GLASS CROSS CONCHOS Totally Unique Unusual UTTERLY Awesome!!! 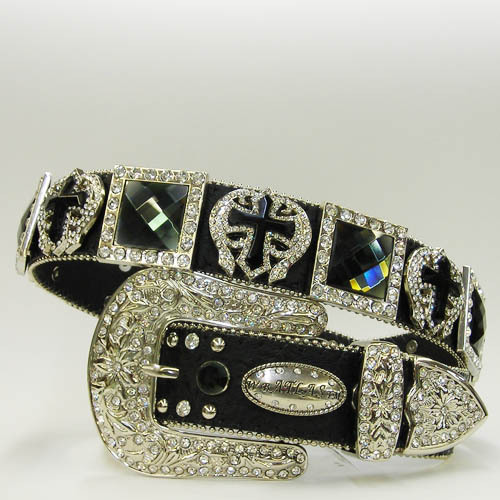 *BRAND ATLAS BELT COLLECTION *RHINESTONE BUCKLE WITH PRISM CUT STONES *EASY SCREW ON BELT STRAP, EASY TO SIZE *ALL STONES AND STUDS ARE RIVETED Rhinestone Belt with removable western rhinestone snap-on buckle and keeper. This is the kind of belts worn by many celebrities and rodeo. Row silver on each side of belt. 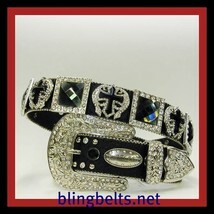 Has Large Square CRYSTAL Conchos AND WINGED CRYSTAL PRISM GLASS CROSS CONCHOS on belt. 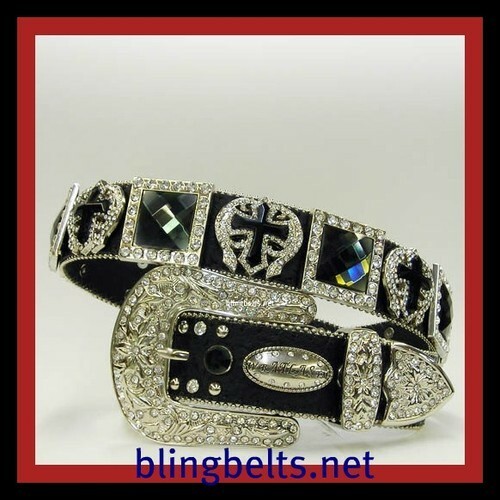 BUCKLE and keeper are filled with rhinestones This was made very intricately with great quality. Belt end is also filled with sparkling CRYSTAL rhinestones and has a unique shape as are both Buckle and keeper in silver area with CRYSTAL rhinestones. Dress up your t-shirt and jeans look with this trendy piece. Goes great with any rainbow color,white,cream,brown or even black matching shoes, boots,hats or purses. Condition: Brand new -never been worn. Color: BLACK OSTRICH Size: XSMALL,SMALL OR MEDIUM OR LARGE OR XLARGE YOUR CHOICE EMAIL AFTER PURCHASE SIZE NEEDED Width: approx 1.5" Size info XSmall is waist sizes approx24-28,Small 27-32, medium 32-36, large 36- 40, Xlg 40-44. (Depends on where you wear your jeans lower or higher measure around that area for better fit) Hope this helps. l Belt sizes are measured from the end of the buckle strap starts to the tip of the belt. Belt sizes: XS(KIDS)=33", S=37", M=39", L=43", XL=46", XXL=51" You would add about 4 to 5 inches to make it whole length of belt from end to end includes whole buckle and whole end. Measurements above without buckle. YOUR CHOICE OF XSMALL OR SMALL OR MEDIUM OR LARGE OR XLARGE YOUR CHOICE of ONE BELT- EMAIL AFTER PURCHASE SIZE NEEDED) Picture does not do this belt justice.Taken with camera phone. Please email at allforms4less at yahoo-for quicker response if you have any questions. For international shipping email for rate. Thanks! SHIPPING Next business day EXCEPT IF PURCHASED ON WEEKEND FEEDBACK! I leave 5 star feedback after you do. That way I know you received and love the belt! NOTE:USPS just raised shipping costs -January 22nd charges final value/selling fee on total cost of item including shipping cost.